I didn't have time to reflect on the two big video game news stories of the last week or so. Interestingly, this blog's occasional bête noire, Nintendo, is at the centre of both. First was the gaming phenomenon of the year and probably the decade - the ubiquitous Pokémon Go. 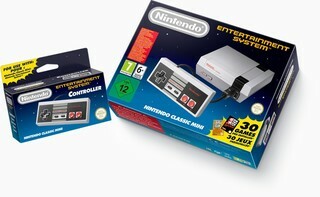 And the other is ... the sort of re-release of the Nintendo Entertainment System. Excuse me, what? We've had occasion to scratch our heads at some of Nintendo's bizarre business decisions, so on the face of it putting out a system that turns 33 this year seems to lie in that tradition. And yet, it also makes perfect sense. Dubbed the Nintendo Classic Mini, what's being released isn't the endearingly unreliable breeze block of old, but a compact plug-in and play. No blowing on cartridges or wiggling them about in the hope of getting the bloody thing working, just wire it up and you're good to go. Retailing at an as yet undecided figure (thanks to Brexit, likely to be a wheelbarrow of used twenties), buyers have the choice of some 30 built-in games. There are titles here that defined the NES and will be widely known - your Marios, Zeldas, Metroid, and so on. There's a handful of key third party games as well. Mega Man 2, Ninja Gaiden (Shadow Warriors to us PAL people), and Castlevania are well known and notorious in equal measure. There's some filler. Why Ice Climber and Galaga are there is something of a mystery. Tecmo Bowl was a well-received and popular American footy title over there, but I can't see it attracting many plays from UK purchasers of the Mini. I suppose Donkey Kong had to be on there (yawn), but why did Nintendo decide to license Super C over Contra (Probotector for us)? Perhaps the original game is too much of a money spinner for Konami on the virtual console. And there's a couple of titles that never made it over here, namely the original Final Fantasy and Star Tropics. RPG-tastic. Okay, for sad sacks like me who are only truly comfortable playing video games from yesteryear (so much for the professed accelerationism), this could be a worthwhile purchase. Not all the NES games available on the Mini are easy to find or inexpensive to pick up. You'll find seven of these among my stack of carts, and I'm not willing to blow silly money on say Castlevania, which can go for over a hundred quid boxed and complete. Then again, I'm in the niche retro game market, and while it's of a size sufficient to support Retro Gamer magazine, specialist markets, and an ecosystem of independent stockists of old stuff, it alone probably isn't big enough for the Mini. In America where, obviously, the retro scene is bigger, there's a larger core audience receptive to something like this. Lest we forget, the NES had the US video game scene locked down for years in the late 1980s. Beyond the retro freaks Nintendo is well positioned to pluck at the nostalgic heart strings of gamers who grew up with their machine. It could be one of those purchases "for the kids" that mum and dad end up spending Christmas Day playing, or something like that. And I'm sure the Mini will do well there. In Europe, which was never properly conquered by Nintendo, it's slightly different. The home computer formats, then Sega, then Sony carried all before them. In addition to retro folks, the Mini might appeal to younger gamers into their video game history and, ugh, hipsters. But enough for it to be considered a success? As I've suggested previously, it's now possible to feel nostalgic about how we used to do nostalgia. Before the advent of popular streaming services, playing old games and digging out old albums often demanded a rummage through the loft or under the bed. This is exemplified in Umberto Eco's 2004 novel, The Mysterious Flame of Queen Leona. To help rebuild his memory, the lead character spends almost the entire book turning his grandfather's loft upside down to dig out the old comics and magazines he grew up with. Now, he'd just have to search for a few phrases and the PDFs of those old strips are at the end of a mouse click. Nostalgia then was dependent on a certain level of inaccessibility. Now, effectively, we're in the eternal present. Everything can be listened to, watched, and played as and when. Nintendo's Mini allows for the accessible to be a little more accessible by providing a reliable iteration of its classic machine. No loading difficulties. No hunting high-and-low for classic carts. No extra virtual console purchases necessary. It makes the convenient even more convenient, and adds to the effacement of nostalgia old-stylee. If you're vaguely into old games, and the price turns out to be okay, you too can do your bit in helping this process along.